If it is true that those who champion the work of Judaism’s great sages will find themselves receiving support from those sages, the 10th-graders at Bruriah High School for Girls can assume they have some very wise teachers backing them. A few months back, at the urging of school principal Marcy Stern, the girls’ Jewish studies teacher Nechama Rosen challenged them to each choose a gadol, a great sage, and put together a visual presentation highlighting the main events of his life and the key points of his teaching. 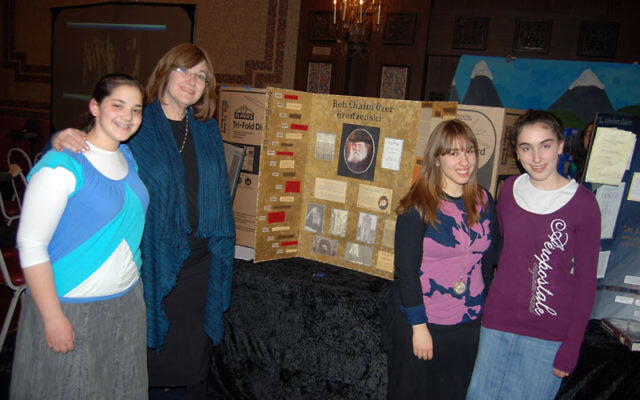 The results were exhibited in a multi-media presentation that was on display April 6 and 7 at the school, part of the Jewish Educational Center network in Elizabeth. The response from students, parents, and other visitors was so enthusiastic that even before the exhibit was dismantled, plans were afoot to put it up again some time after Passover, so students from other schools can see it, too. The tone was set by a prominently displayed quote: “Only through learning from one’s Rebbe can one truly obtain Torah.” The girls found and created all kinds of illustrations, but said most of their effort went into exploring the wisdom of the famous teachers. While a video played on one wall, the girls stood by their displays, ready to discuss them. Each had a three-sided board adorned with pictures, quotes, and a historical time-line. Some had laptop computers with videos they had found on-line, and a couple had videos they had actually assembled themselves. Seniors from the Gadolim Club, which studies the sages, had helped the 10th-graders mount the show, and they created the big displays that the exhibit began with. First was a series of maps, constructed with fabric-covered shapes linked by long ribbons, showing where the various rabbis came from and where they settled. On another wall in the auditorium was a board covered with dozens of pictures of bearded rabbis, overlaid with a winding line of plaques bearing the men’s names, showing the link, generation by generation, from Moses almost to present times — to Rabbi Pinchas Mordechai Teitz, who founded the JEC in 1941. Stern said the boards would be on permanent display. “They are wonderful teaching tools,” she said. Though the display was virtually all about men, there was one real-life strand linking the girls to the one woman featured in the lineup. Their vice principal, Shlomis Peikis, pointed out that her mother studied at the women’s yeshiva established in Brooklyn by Rebbetzin Vichne Kaplan, who had studied with Sarah Schenirer, head of Bais Yaakov in Cracow, Poland.